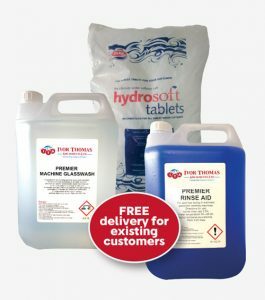 Premier machine glasswash, Premier rinse aid and hydrosoft salt tablets – A perfect finish every time! Ensure your glasswasher gives you the perfect wash and is kept in prime condition by using our approved products. In most cases we can supply cheaper than your existing supplier and offer you peace of mind. FREE delivery for existing customers. Ask us about our introductory starter pack offer. Call us today on 0345 061 5050.
https://www.ivor-thomas.com/wp-content/uploads/2018/03/Screen-Shot-2018-03-02-at-10.04.54.jpg 565 500 High Profile Limited https://www.ivor-thomas.com/wp-content/uploads/2016/11/Ivor-Thomas-logo-web-retina.jpg High Profile Limited2018-03-14 14:49:372018-03-14 14:49:37Premier machine glasswash, Premier rinse aid and hydrosoft salt tablets - A perfect finish every time!